Bonds issued by the US Government are low-risk investments issued in order to finance the national debt. There are numerous types of Government bonds. Each bond has specific features that determine how much interest is paid to the bond holder, how long the bond’s term is, and how the bond is purchased. The different kinds of bonds are known by their "series" letters. Series E bonds are one of the kinds of US Savings Bonds. The last of the Series E Savings Bonds stops earning interest in 2010, which means that anyone still holding Series E Bonds is losing out on interest payments soon. Smart financial planning tips from many experts suggest re-evaluating Savings Bond advantages and disadvantages before automatically rolling them over into new Savings Bonds like the current Series EE Savings Bonds. Series E bonds, or Government E Bonds, were first issued to fund World War II efforts. The bonds were commonly known as war bonds. The very first E bond was purchased by President Franklin Delano Roosevelt. The term E bond was just an extension of the original savings bond naming system. Earlier bonds were called "baby bonds" and were named as Series A, B, C, and D bonds. Thus the question What does Series E bond mean can be answered best by saying that it only means that E comes after D.
Early versions of US Savings Bonds were sold through the Post Office. People often still ask about buying Government Bonds at the Post Office as a result of either remembering the earlier practice, or having heard about it from older relatives like parents or grandparents who used to buy bonds in that way. Today, US Savings Bonds are sold by some banks, although the majority are sold through the U.S. Treasury Direct Website for selling savings bonds. Quick interruption for the writing business start-up guide. In 1941 when the Series E bond was created, a national volunteer program was created. The country’s business leaders and financial institutions helped sell the war bonds. The sale of Series E bonds allowed the country to quickly increase production of goods needed to fight World War II and continue funding the war effort in general. This patriotic slant toward the sale of bonds greatly increased the number of households with bond investments and raised awareness of U.S. Government Savings Bonds. Savings Bonds became a staple of most personal financial planning advice because of their safety and low minimum investment. >E Bonds were issued for a fixed-term. The bonds matured after 10 years, but could be granted extensions that allowed them to earn interest for up to 30 or 40 years, depending upon issue date. 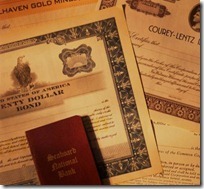 E Bonds that were issued between 1941 and November of 1965 earned interest for 40 years. The other E bonds issued between December 1965 and June 1980 earned interest for 30 years. Series E bonds were first sold in 1941 and continued to be issued until they were replaced by Series EE bonds in 1990. That means that the last Series E bonds stop earning interest in 2010. Series E bonds issued before September 1979 have already stopped earning interest. E Bonds were originally sold for 75% of their face value and they earned 2.9% interest. Original denominations were $25, $50, $100, $500, and $1,000. Later, a $5,000 and $10,000 bond were added, and soldiers were offered a $10 denomination. I worked for the post office and had savings bond. I may have lost some. Is there any way I can research this? Yes. Savings bonds are not bearer instruments. They have registered owners who own the bonds no matter who has the pieces of paper, or if no one has the paper. Use the Treasury Direct website noted above. There is a link to look up bonds that you might still have using your Social Security number and other identification.